Innovative Earthquake Soil Dynamics deals with soil dynamics in earthquake engineering and includes almost all aspects of soil behavior. Both generally accepted basic knowledge as well as advanced and innovative views are accommodated. Major topics are (i) seismic site amplification, (ii) liquefaction and (iii) earthquake-induced slope failure. Associated with the above, basic theories and knowledge on wave propagation/attenuation, soil properties, laboratory tests, numerical analyses, and model tests are addressed in the first part of the book. A great number of earthquake observations in surface soil deposits as well as case histories with new findings are addressed in the later chapters, together with associated laboratory test data. Most of the research results originate from Japan, which is rich in earthquake records and case histories, although mostly isolated from the outside world because of the language barrier. Another important feature characterizing this book is an energy perspective in addition to the force-equilibrium perspective, because it is the author’s strong belief that energy is a very relevant index in determining seismic failures, particularly of soils and soil structures. Innovative Earthquake Soil Dynamics is written for international readers, graduate students, researchers, and practicing engineers, interested in this field. Prof. Takaji Kokusho is Professor Emeritus at Chuo University since 2015. He obtained his BS and MS degrees from the University of Tokyo, and a MS degree at Duke University, USA. He completed his PhD (Doctor of Engineering) at the University of Tokyo in 1982 on the topic of "Dynamic soil properties and nonlinear seismic response of ground.". Takaji worked at the Central Research Institute of Electric Power Industry (CRIEPI) between 1969 and 1995 as researcher, head, and director of Siting Technology for Earthquake Geotechnology. He wasProfessor at the department of Civil and Environmental Engineering at Chuo University between 1996 and 2015. In this time, he published more than 100 reviewed research papers in national and international journals and conference proceedings, and served as a chairman of Technical Committee No. 4 of ISSMGE (2005-2009), Earthquake Geotechnical Engineering, and Asian Technical Committee ATC3 of ISSMGE (1998-2005), and Geotechnology for Natural Hazards. 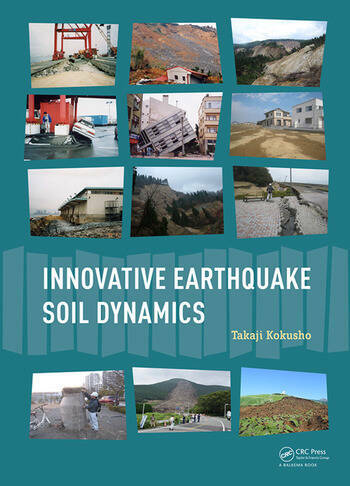 "The book Innovative Earthquake Soil Dynamics is very appropriately titled and reflects the unique background and extensive expertise of the author, Dr. Takaji Kokusho, Emeritus Professor, Chuo University, Tokyo, Japan. The book is composed of six chapters that can be grouped into four categories: background material (Chapters 1-3), site amplification and dynamic soil-structure-interaction (Chapter 4), liquefaction and related phenomena (Chapter 5), and earthquake-induced slope failure (Chapter 6). The background material presented in Chapters 1-3 gives an in depth coverage of elastic wave propagation in soil, dynamic soil properties, and soil modeling and sets the stage for the topics covered in the latter chapters. Innovative Earthquake Soil Dynamics is unique from other books on geotechnical aspects of earthquake engineering in that it includes a detailed coverage of soil dynamics, as related to earthquake engineering, in addition to the oft-presented empirical relationships. The book is innovative in that it presents the material from both "traditional" (e.g., stress-, strain-, and force-based perspectives) and "energy" perspectives, with the latter largely derived from the author’s own extensive research. The author shows that energy is central to site amplification and dynamic soil-structure-interaction and can be used as a simple index for evaluating liquefaction and related phenomena and earthquake-induced slope failures. Another unique aspect of Innovative Earthquake Soil Dynamics stems from the author having received his higher education in both the United States (Duke University) and Japan (University of Tokyo), and having spent the first half of his career working for the electric power industry in Japan and the second half of his career as a professor at Chuo University. As a result, the material presented in the book reflects research and engineering procedures from both Japan and the United States, as well as other countries, and all the material presented builds to applications in engineering practice. The book is equally suited to serve as a text for graduate courses in geotechnical aspects of earthquake engineering and soil dynamics or as a reference book for practicing engineers." Russell A. Green, Professor of Civil and Environmental Engineering at Virginia Tech, Blacksburg, Virginia, USA.